The People’s Democratic Party-Bharatiya Janata Party alliance in Jammu and Kashmir was described by late PDP founder Mufti Mohammed Sayeed in 2015 as meeting of the ‘north pole and south pole’ but the BJP's exit three years later sparked a blame game and led opposition parties to call it opportunistic politics. Congress president Rahul Gandhi said that the 'opportunistic BJP-PDP alliance' set fire to Jammu and Kashmir, killing many innocent civilians and brave soldiers, and that the damage would continue even if the state was put under central rule. Under the alliance government in the strategically important state, several innocent people and brave soldiers were killed. 'It cost India strategically & destroyed years of UPA's hard work. The damage will continue under President's rule (sic),' he tweeted. Senior Congress leader Ghulam Nabi Azad said the BJP had committed a ‘Himalayan blunder’ by forming a government with the PDP. "The regional parties should have been allowed to form an alliance among themselves," he told reporters in Delhi. The Congress leader hit out at the BJP, saying it ruined Kashmir as much as it could in three years. He also ruled out any tie-up with the PDP. This alliance has devastated the state, be it economically or socially, and has left the Jammu and Kashmir in ruins, Azad told reporters in New Delhi. Terming this fallout between the BJP and the PDP as good for the people of Kashmir, he said, "The BJP did its damage and ruined Kashmir as much as it could in three years and has pulled out now. In the last three years, civilian killings and army deaths have risen sharply." Replying to a question, Azad said, "...There is no question of forming any government with the PDP. The question does not arise." He claimed that he had cautioned Prime Minister Narendra Modi, on the floor of the house, that they had done a Himalayan blunder by having a coalition government with a regional party in Jammu and Kashmir. Echoing similar sentiments, his party colleague and Congress communications in-charge Randeep Surjewala attacked Modi over the fall out, saying the prime minister has left Jammu and Kashmir in ‘deep turmoil’ and ‘is now finding an 'exit route' from this ‘self-created tumult’. In a series of tweets, Surjewala blamed BJP, its ‘conniving alliance’ and ‘lust’ for power for pushing the state into an unending cycle of violence and terror and said that radicalisation at its peak and peace is biggest casualty, adding that that in four years of the alliance government, 373 jawans and 239 civilians lost their lives. ‘Is this how PM's promise of ‘Jamhooriyat, Insaniyat and Kashmiriyat' fulfilled, or was this also another ‘Jumla'," Surjewala questioned. Azad also said that this fallout is a total failure on the part of government. "The BJP should be squarely held responsible. It and the central government cannot shy away from the responsibility," he added. The Left parties said the coming together of the BJP and the PDP, after the assembly polls in 2014 to form a government, was itself ‘opportunistic’. "Such coalition should not have happened. These two parties have no similarities. They coming together was an opportunistic move to be in power," Communist Party of India-Marxist General Secretary Sitaram Yechury said. The BJP unit in Jammu and Kashmir said the decision of the BJP to pull out of the government was a ‘well thought’ decision. Delhi Chief Minister Arvind Kejriwal slammed the BJP for pulling out of its alliance with the PDP and alleged that the party had ‘ruined’ the state. Communist Party of India-Marxist leader and MLA M Y Tarigami said the leadership of both the PDP and the BJP are answerable before the people of Jammu and Kashmir and rest of the country for their unprincipled alliance which ended today but not before sending the state in deep crisis. The Nationalist Congress Party said the saffron party took the decision in a bid to ‘save’ itself from the ‘governance failures’ of the last three years. "The four-year-old BJP rule at the Centre and the three-year-old coalition of the BJP and PDP in J&K has been an utter failure. 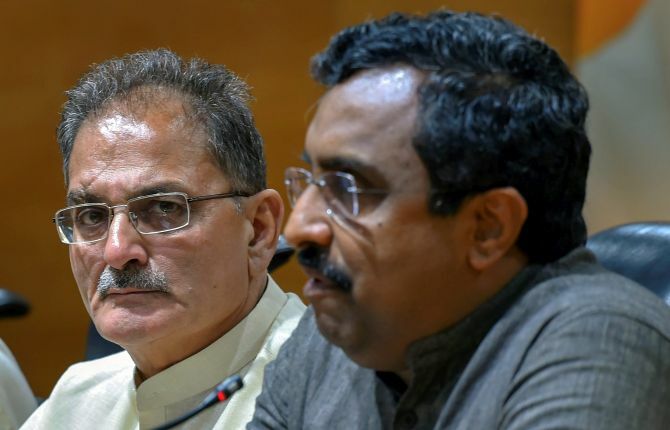 The BJP's decision to pull out (of the coalition government in J&K) is a bid to save itself from the governance failures of the last three years," alleged NCP national spokesman Nawab Malik. Maharashtra Congress president and former chief minister Ashok Chavan tweeted, ’BJP is trying to run away from responsibility by withdrawing support to PDP in J&K. Both parties together have ruined the chances of resorting peace and tranquility in the valley and in the state as a whole’. However, ally Shiv Sena lauded the BJP for walking out of the government in Jammu and Kashmir, but questioned why it took ‘three years and sacrifices of 600 soldiers’ for the Amit Shah-led party to realise that the coalition with PDP was ‘useless’. The Sena, second largest constituent of the National Democratic Alliance, also wondered if the BJP's decision to pull out of the state government was taken to avoid ‘uneasy questions’ over violence against soldiers ahead of the 2019 Lok Sabha polls. "I congratulate the BJP for their decision," Shiv Sena chief Uddhav Thackeray said while addressing party workers at the party's 52nd anniversary celebrations in Mumbai. Thackeray, who has often criticised the BJP over joining hands with the PDP, said, "Did it take three years and sacrifice of 600 soldiers for you (the BJP) to realise that this (Jammu and Kashmir) government is useless?" Earlier, senior Sena leader Sanjay Raut dubbed the BJP's decision to snap ties with the PDP as a ‘political move’ and said the coming together of the two parties to form the government had been ‘unnatural and unholy’. The Rajya Sabha member said Thackeray had opposed the tie-up, calling it an ‘anti-national’ alliance. Raut alleged that the BJP and PDP had ‘cut a deal’ to gain power in the state, adding Indian soldiers had to pay a ‘big price’ for it as many of them attained martyrdom after the two parties formed the government in 2015.